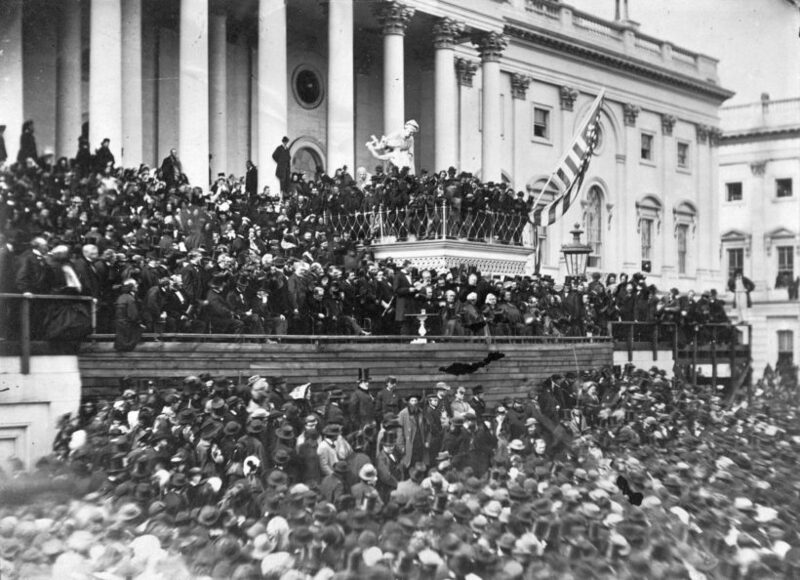 This photograph (top) of Lincoln delivering his second inaugural address is the only known photograph of the event. Lincoln stands in the center, with papers in his hand. John Wilkes Booth is visible in the photograph, in the top row right of center. (by Richard Brookheiser, New York Post) – … 150 years ago [yesterday, March 4th, Abraham Lincoln] shared with the nation the bittersweet fruits of his [spiritual] struggle, in his Second Inaugural Address. Lincoln’s speech was in fact a sermon, delivered on the East Portico of the Capitol. In 700 densely-packed words he outlined the roles of God and men in history: God ruled history and judged it; at the same time, Americans were duty-bound, under God’s guidance, to make their country a better place. Lincoln hadn’t always been much concerned with God. As a young man he admired the skeptic Thomas Paine. Young Lincoln was so impressed, he wrote a Paine-ite pamphlet of his own, and planned to have it printed — until Samuel Hill, an older friend, burned it. Lincoln was already interested in politics; Hill’s act spared him future, potentially career-ending embarrassment. Then time, and the horrors of war, brought change to his views. He began writing about religion in September 1862, after two Union losses in the Seven Days’ Battle and the Second Battle of Bull Run. Trying to find a meaning in these bloody debacles, Lincoln laid out his thoughts in a private memo. “God now wills the removal of a great wrong, and wills also that we of the North as well as you of the South, shall pay fairly for our complicity in” it. That is: God willed the Civil War to abolish slavery, and also to punish all those, South and North, who had profited from it. Eleven months later, in his Second Inaugural, Lincoln cast these thoughts in sonorous prose. How far Lincoln had moved from Paine, who wouldn’t tell the crucifixion story to a child because it involved a murder. Now Lincoln’s God exacted the deaths of hundreds of thousands of men in battle to atone for the enslavement of millions throughout American history. It was a vision of implacable justice. But Lincoln wasn’t done yet. God remained in the picture as a guide. But it was men who had to repair the damage of the past and establish a just future – to do the hard work of mercy. Lincoln’s parade of verbs – strive, finish, bind, care, do, achieve, cherish – suggested the labor that lay ahead. His last thought was a hope: Americans could work to make their country more just. In the event, Americans would have to take up that work without him to lead them. A scant six weeks after Lincoln’s Second Inaugural – six weeks that would, ironically, see the Civil War won – came his assassination at the hands of John Wilkes Booth. Published March 3, 2015 at The New York Post. Reprinted here March 5, 2015 for educational purposes only. 2. Read the full text of President Lincoln’s 2nd inaugural address under “Background” below. What do you think of this speech? At this second appearing to take the oath of the presidential office, there is less occasion for an extended address than there was at the first. Then a statement, somewhat in detail, of a course to be pursued, seemed fitting and proper. Now, at the expiration of four years, during which public declarations have been constantly called forth on every point and phase of the great contest which still absorbs the attention and engrosses the energies of the nation, little that is new could be presented. The progress of our arms, upon which all else chiefly depends, is as well known to the public as to myself; and it is, I trust, reasonably satisfactory and encouraging to all. With high hope for the future, no prediction in regard to it is ventured. On the occasion corresponding to this four years ago, all thoughts were anxiously directed to an impending civil war. All dreaded it – all sought to avert it. While the inaugural address was being delivered from this place, devoted altogether to saving the Union without war, insurgent agents were in the city seeking to destroy it without war – seeking to dissolve the Union, and divide effects, by negotiation. Both parties deprecated war; but one of them would make war rather than let the nation survive; and the other would accept war rather than let it perish. And the war came. Neither party expected for the war the magnitude or the duration which it has already attained. Neither anticipated that the cause of the conflict might cease with, or even before, the conflict itself should cease. Each looked for an easier triumph, and a result less fundamental and astounding. Both read the same Bible, and pray to the same God; and each invokes his aid against the other. If we shall suppose that American slavery is one of those offenses which, in the providence of God, must needs come, but which, having continued through his appointed time, he now wills to remove, and that he gives to both North and South this terrible war, as the woe due to those by whom the offense came, shall we discern therein any departure from those divine attributes which the believers in a living God always ascribe to him?